The habit of lumping together groups of people — often furriners, but not always — into an undifferentiated mass is one of the Naval Diplomat’s pet peeves. There is no “the Chinese,” “the Japanese,” or other groups whose members all purportedly think alike. A related, and perhaps even more baleful habit is assuming that enemies are uniformly wicked. Which brings us to a new book about World War II from co-authors Adam Makos and Larry Alexander. (Thanks to my amphibian pal Commander Salamander for the tip.) Titled A Higher Call, the book chronicles the life of Franz Stigler, a fighter ace in the German Luftwaffe, or air force. An airline pilot who hailed from Bavaria, Stigler joined the Luftwaffe when recruiters made him an offer he couldn’t refuse. He battled Britain’s Desert Air Force over North Africa, fought against Patton and Montgomery in Sicily, and ended up opposing the Allied combined bomber offensive against Germany. 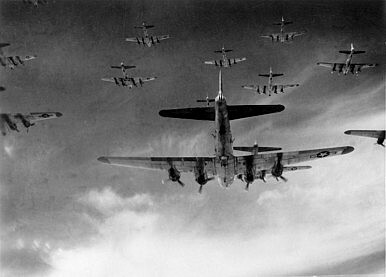 Just before Christmas time in 1943, he had a chance to bring down a crippled straggler from a massive B-17 raid against his homeland. Stigler passed up the chance. His forbearance stemmed from a code of honor that forbade attacking helpless enemies. That code bound combat pilots even in Germany’s life-and-death struggle against the Grand Alliance. Long after the war Stigler met and befriended Charlie Brown, the U.S. Army Air Forces pilot whose life he had spared. A Higher Call isn’t just a rollicking good read. It is history with a purpose. Makos and Alexander leadoff their account with a simple question: can decent men fight on both sides of a bad war? Stigler’s life is Exhibit A in their case for the affirmative. For a descendant of decent men who fought in good causes and at least one who fought in a wretched cause — family lore has it that my great-great grandfather had to trudge home from Georgia to Middle Tennessee after fighting against General Sherman — this is a congenial way of looking at the past. It also happens to be empirically true. It seems not even Hitler’s war machine was made up wholly of mustache-twirling evildoers. Does the fact that pockets of honor and goodwill exist among enemies mean bloodshed can always be avoided? Hardly. But understanding that nations and organizations are bodies of people, each with his own motives and worldview, is part of knowing the human terrain in times of strife. Reducing opponents to scum and villainy, furthermore, risks foreclosing opportunities for eventual peacemaking and reconciliation. In short, affording the enemy due respect is wise politics and strategy. That’s not a bad takeaway from a work about aerial warfare — especially at a time of year when we hope for peace on earth.